How many black belts at your club? Discussion in 'Grappling Technique' started by HuntingtonBeach, Mar 21, 2008. I just realized we have between 10-15. I read that people in the midwest are being trained by blue and purple belts makes me realize how lucky I am to live in Sunny So Cal. How many do you guys have regularly at you gym? This is BJJ, by the way. None. But one of my instructors is really close to receiving it by Dean Lister. 2ea. Both are our instructors. Both are very good and very knowledgeable. At my club regularly is 1, the main instructor. In total our club has four. should be another after pan ams. I've got one main Instructor and 1 guest instructor. 1 Gracie Black Belt (club i usually train at), at another club we have 2-3 regular gracie black belts. 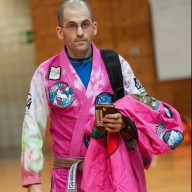 1 black belt, my instructor. 1 black belt, we did have a couple of regular browns but the have moved on, and a few purples.